It’s time to do something about those dirty windows! Shepherd’s Company is a recognized expert in Missouri for residential and commercial window cleaning, with over 20 years of experience. Our team of professionals have the knowledge and experience to get your home, office building, apartment complex, storefront, restaurant, or condominium looking like new. When you hire Shepherd’s Company, you can rest assured your windows will be washed properly and safely, restoring a clean appearance and letting the light back in. Our services include professional window washing and cleaning for your home or business, both inside and outside. We employ efficient and thorough techniques, using a three-phrase approach of applicating, squeegeeing, and toweling. 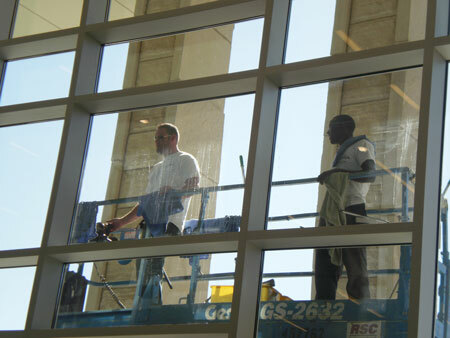 We eliminate dirt and debris on sills and frames by hand, and can reach high windows with ladders or lifts when needed. Our workers come equipped with a professional apparatus including extended poles, buckets, window tools, and clean towels. Our professionals will remove dirt, dust and grime from your interior and exterior window surfaces. Hard to eliminate spots from of calcium deposits or other agents can usually be cleaned as well by our team. 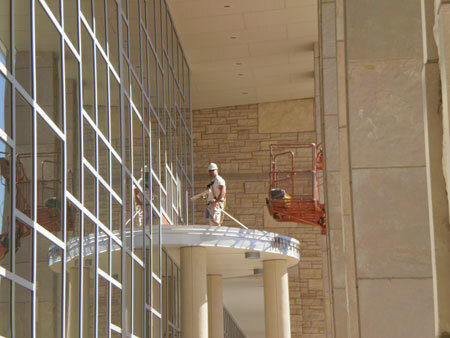 For construction cleanup jobs and grand openings, we can provide experienced crews to clean your windows and also power wash your surfaces. Window cleaning and power washing in tandem provide doubly impressive results in restoring the appearance of a home or office. 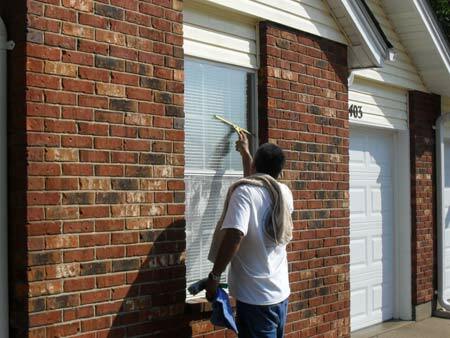 Cleaning both the windows, roof, and siding together will restore it to a well-kept appearance. When customers request both window cleaning as well as pressure washing their entire building, we power wash their house or office first, then come behind and do the windows.